As a specialist in blank verse, I was fortunate to be involved in a fascinating project organised by the University of Leeds to mark the 400th anniversary of the deaths of both Shakespeare and the Ming dynasty playwright Tang Xianzu. A new stage production was presented by two groups preparing and rehearsing on different continents, with Beijing-based students from the University of International Business and Economics (UIBE) adapting A Midsummer Night’s Dream, while students from Leeds University reworked Tang’s Nanke-ji (A Dream Under the Southern Bough). 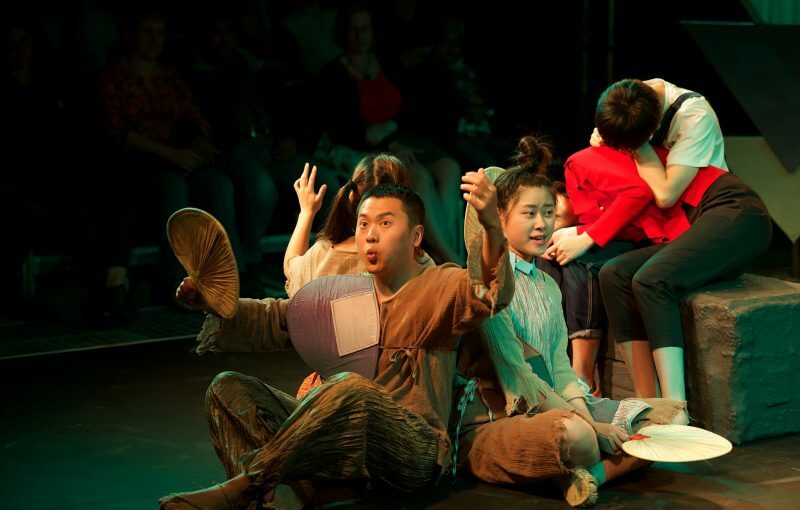 The adaptations were performed at both Universities before appearing at the 2016 Leeds Intercultural Festival and the Edinburgh Festival Fringe. This was followed by a tour of China taking in Beijing, Shanghai, and Tang’s hometown Fuzhou during the Tang Xianzu Memorial Festival. Ruru Li, Professor of Theatre Studies at the University of Leeds, suggested I assist Jun Li, director of UIBE’s A Midsummer Night’s Dream, in some aspects of their script. Jun, a passionate advocate of Shakespeare’s style, wanted to remain faithful to the poetic nature of the work even though this aspect of the adaptation might prove challenging to non-native English speakers. Jun sent across the script, which he had written with co-adaptor Bingying Wang. The adaptation clearly took inspiration from parts of the original text that echoed aspects of Chinese culture. This was shown by the working title of the play: “A Midsummer Night’s Dream at Sophora Nest 槐树爱巢仲夏梦”. The Sophora tree (Chinese scholar tree) 槐树 is associated with dreams in ancient Chinese stories and legends, and also served as the main set in the Leeds University adaptation of Tang Xianzu’s “Southern Bough”. The characters, too, were taken from Chinese traditions. Inspired by Puck, together with Oberon and Theseus, the play contained a chorus-like assembly of three Spirits to represent different attitudes towards love: Sense, Sensibility and Moderation. Jun pointed out that as ‘moderation’ is a quality highly valued in China, this Spirit was portrayed as especially Chinese. Jun wanted the Spirits especially to speak in iambic pentameter, in order to distinguish their voices from the non-magical characters. We had an idea of what these Spirits should say: it was a case of converting the dialogue into blank verse. This mirrors how I work on iambic pentameter, firstly by creating an overall plan of the meaning and then transforming it into poetry. With a modern work in a classic style, it is possible to refer to aspects of contemporary life, making new metaphors and allusions possible. This is an advantage of poetic dialogue, as comparisons are naturally drawn between one thing and another, drawing in complex ideas and making them human. Jun also requested that I edit the script and polish the language. Overall, the script contained prose dialogue, modern references, and new passages of iambic pentameter together with passages from the original play. It was important to maintain an overall tone to unite these elements while remaining faithful both to the source material and the specific cultural aspects of the adapted work. I avoided specifically Elizabethan words, modernising the language so there was uniformity within the whole script to tie all the different aspects together. The writing process was flexible, with the text re-drafted after rehearsals as the students improvised and explored new ideas. The run up to the opening performance demonstrated that this project was a significant cultural exchange. While visiting the UK, Chinese President Xi Jinping addressed the idea of a joint celebration of Tang and Shakespeare, saying: “China and the UK can join in celebrating the legacies of these two literary giants, to promote interpersonal dialogue and deepen mutual understanding.” Liu Xiaoming, the Chinese ambassador to the UK, gave a speech before the world premiere at Leeds University. I saw the play at the Edinburgh Festival, and welcomed the chance to experience all aspects of the production beyond the text, including the actors’ interpretations of the lines and the use of music with some of the iambic dialogue. From an audience perspective, some would be unfamiliar with Shakespeare, while others would be new to Tang. “Dreaming Under the Southern Bough” told the story of a man falling into a dream in which he becomes ruler of an Ant Kingdom, slowly becoming corrupted by power. For their adaptation, the Leeds students updated the central character as a soldier back from Iraq, rather than the unsuccessful officer who lost his military position due to drunkenness in the original. Afterwards, I was left wanting to find out more about Tang, and I expect those unfamiliar with Shakespeare had the same reaction watching the UIBE performance. This project involved many people through study, practical theatrical work, and cross-collaboration. My own small part in this production revitalised my writing practice with new ideas and a welcome chance to work with some inspiring academic and arts practitioners. As Ruru commented when working on the project, “It is a genuine intercultural practice, both thought-provoking and a great pleasure for everyone involved.” It is also a testament to the enduring qualities of the classic form that these playwrights, four hundred years after their deaths, can still have their work produced and adapted in such a modern way.